The exhibition opened with a reception ceremony on December 3, 2017, 1 - 4 p.m. at the Islamic Cultural Center of Northern California (ICCNC) at 1433 Madison St., Oakland 94612 and ran to February 24, 2018. Read about the Curatorial Panel HERE. Read about the background of this exhibition HERE. To view the 2017 Call to Artists and Exhibition Conditions and Timeline CLICK HERE. 12” x 9.25” x 3.5"
Hand in Hand K-12 are centers for Arab-Jewish education in Israel. Deeply inspired by their mission to create a shared society in Israel, I wanted to create a mezuzah case that would reflect their interfaith advocacy and be of benefit to their schools. So many horrible atrocities happen in the name of G-d, that I wanted this piece to be about drawing attention to the people here and now who are healing those wounds. My husband David Casella contributed to this project by suggesting I pierce out the Arabic calligraphy (in negative space) so that the Hebrew on the Torah scroll inside the case may be visible through the Arabic calligraphy. Nabeela Sajjad is the founder of Islamic Art Exhibit, a non-profit organization (2009). 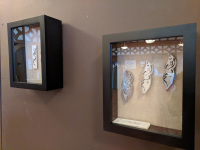 They exhibit artwork by local Muslim Artists in the Bay Area libraries and Islamic Centers to promote Islamic Art to the greater American audience and provide a platform for the talented Muslim Community. Nabeela has a Bachelor's Degree in Mechanical Engineering from Pakistan. She settled in the United States in 1992. She resides in the San Francisco Bay Area, California with her husband and three children. Endorsed by His Holiness the Dalai Lama and Pope Francis, Aimee Golant is an interfaith advocate, a sixth generation metal artist, and a granddaughter of Holocaust survivors, originally from Los Angeles, California. Upon her graduation from San Francisco State University, she began her career as a metal artist creating Judaica and jewelry. She exhibits and sells her unique metal art internationally. “Calligraphy and Ceramics” brings calligraphy of different faiths and traditions on to ceramic works and makes it accessible through an installation that encompasses two sets of functional and ritual ceramic wares being arranged on a table, at which visitors can seat, view and examine the ceramics, and have conversation with each other. Through “Calligraphy and Ceramics” the three participating calligraphers from Persian/Islamic (Arash), Roman/Christian (Beth), and Jewish/Hebrew (Rachel) traditions collaborate to explore how their faith and culture play role in their calligraphic work and how it manifests itself on ceramics. Working with two award winning ceramists, Forrest and Susan, with different styles provides the calligraphers and the audience an opportunity to examine the interaction of calligraphy and ceramics in a deeper level. 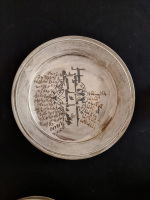 Forrest employs a method called Volumetric Image Transfer, in which he converts the calligraphic text into digital file and transfers it through silkscreening on to ceramics. 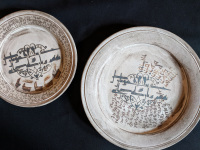 Susan makes pit fire ceramics with a surface that the calligraphers can inscribe directly on, with their traditional ink and pen or brush works. Arash Shirinbab is an award winning artist and calligrapher and has managed to be a successful blend of artist, Arabic-Persian calligrapher, and designer, as well as art administrator, art curator, and entrepreneur for the past ten years. He studied Industrial and product design at University of Tehran from 2001 to 2006 and earned BA and MA in the field of design. He has participated in over 70 exhibitions (over 10 solos) nationally and internationally. Beth Schaible is a letterpress printer, bookbinder, calligrapher and graphic designer originally from the east coast and currently living in Petaluma, California. She is the proprietor of Quill and Arrow, a small press and design studio where she creates her own body of works on paper and also works with clients to bring their own vision to life. Forrest Lesch-Middelton: Originally from Vermont and raised in Seattle, Forrest Lesch-Middelton lives and works as a potter and tile artist in Petaluma, California. Former Ceramics Program Director at Sonoma Community Center, and currently Visiting Professor at Sonoma State University, his extensive background as an arts educator, administrator, and studio potter. Rachel Stone: Originally from Oakland, Rachel has a BA from Wesleyan University focusing on gender and ethnicity in a post-colonial context. Trained at Mills College, her philosophy of teaching at Park Day School has been shaped by her own experiences in Bay Area progressive communities and eleven years at Park Day School. Susan Duhan Felix: This summer Susan Duhan Felix had a Retrospective of 60 years of ceramics at the GTU library in Berkeley. 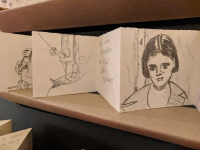 She has had two solo exhibitions at the Bade Museum in Berkeley, and solo exhibitions at Hebrew Union College Museum in New York City, Jewish Heritage Museum in Danville California and the Magnes Museum in Berkeley. The sacred texts of our spiritual communities share core messages of wisdom, compassion and justice. The intention of the Veil Tapestry is to embrace these concepts. 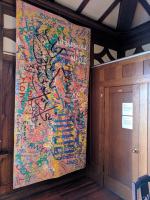 Individuals from the Interfaith community choose words and phrases in their original language from their spiritual texts or their faith traditions and paint them on the canvas.. As these pieces of calligraphy, these words and phrases fill the spaces, painted one on top of the other, layer upon layer, the intertwined and rich tapestry of sacred words form the woven veil. This tapestry offers our sacraments as a testimonial of universal faith. We hope that the Veil Tapestry reminds us of "how to become human beings." The Veil Tapestry is a project of Peace Lutheran Church and Interfaith San Ramon Valley. Bill Carmel has been a professional artist for 33 years. His fine art paintings and sculpture are in private, corporate and public collections in the United States, Europe and Australia. 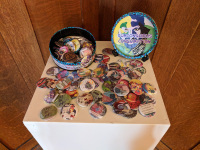 After teaching at Humboldt State University and Southern Illinois University, he settled back into the Bay Area where he remains active in the arts, currently as a co-curator for the Lamorinda Arts Council’s Orinda Gallery. Bill enjoys writing articles for the SFMOMA and SFFAM exhibits, as well as local venues which are published in the blog section of the Danville/San Ramon Express. 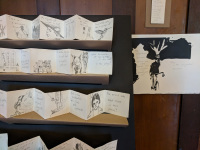 The form of this collaboration references both the tradition of Native American art making use of available materials, including ledger-books, and the Jewish tradition of the book. In the creation of these books both the physical form and the objects referenced bring together and draw distinctions between our traditions. We spent a significant amount of time discussing our personal relationships to our religious traditions and the intersections--as well as the disconnections--between the traditions. We also considered the character of our previous collaborations. In addition, we have both struggled with the normative assumptions of Christianity in American thought and politics, and our relationship to secular as well as religious traditions. Finally, we realized that what we shared in our spiritual practice was a commitment to engaging traditions critically, protecting the environment, and working for social justice. Terri Saul is a Cherokee/Choctaw and European-Danish-American artist. Her grandfather Chief Terry Saul was also an artist and art teacher, part of the Native American Church, and chair of the art department at Bacone College. Her Choctaw and Cherokee grandparents were sent to boarding schools where their languages and religions were outlawed. Terri is sorting through the post-colonial aspects of her family’s Native American traditions and the dominant thread of Christianity. She is also a secular engaged Buddhist. Carol Dorf is Jewish and belongs to Congregation Netivot Shalom. Her chapbooks include "Every Evening Deserves a Title" with Terri Saul, (Delirious Nonce), "Some Years Ask," (Moria Press), and "Theory Headed Dragon," (Finishing Line). Her publications include "Sin Fronteras," "E-ratio," "About Place," "Maintenant," and "Scientific American." She is poetry editor of Talking Writing. 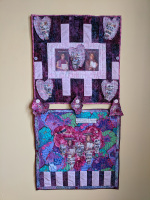 She enjoys creating collaborative work, including as a member of the East Bay Jewish Women's Quilt Group. 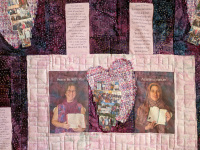 Sacred Texts Connection uses fiber arts and hearts to connect a few sacred texts from the Bible and Quran with photo collages of family, faith communities and the Tri-City Interfaith Council to express the love and justice that connect us all together. The collaboration in this art included Cindy teaching Shamsa fiber art skills; both women choosing design, fiber, photo, and sacred text elements; and Sandy, Sadaf and Rebecca coming in, as the deadline neared, to help us finish on time. Cindy Sojourner is the director of the Liturgical Art Ministry at Niles Discovery Church, a Master Quilter from Piecemakers Quilt Guild of Southern Alameda County, graduate of the American Baptist Seminary of the West, mother, wife, Christian, fiber artist, and advocate for justice. Shamsa Rafay is a calligrapher, graphic designer, community organizer and advocate, Scout mom, Outreach Chair for the Islamic Society of the East Bay, Human Relations Commissioner for Union City, Muslim, mother and wife. 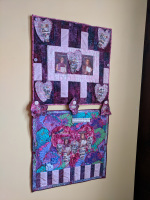 Sandy Thomas is a quilter extraordinaire and design expert with the Liturgical Art Ministry at Niles Discovery Church, a mother, wife and Cindy's dear friend. Sadaf Rasheed is a seamstress, quilter, crafter, educator, mother, wife, and leader of the women's wing at the Islamic Center of Fremont. Rebecca Venable is a Catholic, East Bay community leader, founder of non-profits, domestic violence counselor, advocate for the homeless community, wife and mother. As artists we are asked to plumb the depths of our own being and present what we find for public scrutiny, pearls and dragons alike. Our success is often measured by the degree our hopes and dreams are literally commodified for sale as decorations and trinkets. 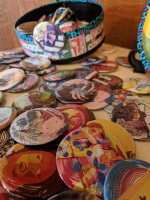 “Subconscious Consumption” explores the juxtaposition between an artist's vision, which is unique in this world, and art as a product, which is mass produced and uniform. 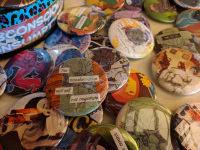 Surrealist and absurdist images, harvested from the minds of the artists will be made into one-of-kind, machine stamped, pinback buttons, presented in a cookie tin, inviting the audience to take home a piece of the exhibition for private consumption. Conceptually all three artists worked together. 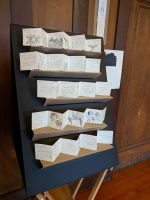 Ameena and Davi provided the primary source material from their own portfolios, and Corinne was the primary craftsman. 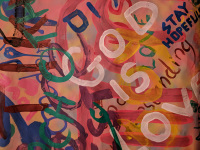 Each images was duplicated, and altered with ink, text, and glitter to ensure each finished piece was one of kind. Our hope is that the images will convey something universally human about the subconscious and the richness of all inner worlds. Further, by giving the viewer an opportunity to choose an image to take and wear, the art invites questions and discussions outside the bounds of the exhibition, and perpetually in the future. Why was that image selected among others? What does it mean to the wearer? And what conversations and connections does it spark between those who attended the exhibition, and those out in the world who did not attend? Ameena Faruki grew up with a fascination for human perception and consciousness. 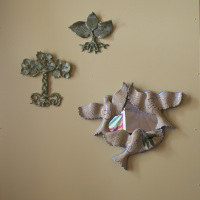 Her work explores the nature of dreams and their absurdities that somehow get accepted as real. Peculiarities are exaggerated through varying degrees of abstraction and loud, unnatural color schemes in portraits that question awareness of the lines between reality and unreality. She is currently based in Atlanta. Davi Barker born in California, Davi spent much of his youth traveling with his family. On this journey he was struck by the world's beauty. Especially breathtaking were the wonders of nature. A lightning storm over a primordial desert in Arabia. Cherry blossom petals sprinkling on the floating markets of Thailand. Snorkeling the coral reefs of the Maldives. Still, few places possess the natural beauty of California, where the sun setting on the bay area always reminds him that God is a better painter than him. I am a dreamer I’ve been told; an idealist who imagines what it would be like to live in peace and love. The art I am presenting reflects my deepest passions. It’s the essence of who I am. As my hands work the cold earth I give birth to objects big and small leaving a piece of my soul in each one. Everything I make has meaning to me. My life reflects my art and my art reflects my life. As a Jewish artist and spiritual being, I have been very concerned by all the turbulence in the world, especially in the Middle East. 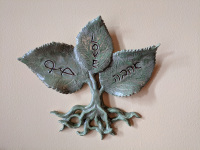 With family living in Israel, I truly welcome the opportunity to participate in an interfaith exhibit, and collaborate with a sister artist from another faith. 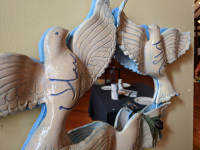 “Reflections on Peace”, is a vision of 3 doves bound together by earth whose sole purpose in this life is to spread the message of peace and do so in 3 languages. From the moment I saw Nabeela’s beautiful calligraphy, I knew I found my partner. 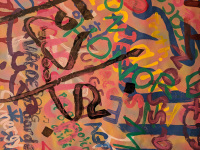 Together we created the pieces “Love” and “Harmony”, and incorporated Nabeela Raza Sajjad’s calligraphy into my art. Dove Govrin born in San Francisco in 1952. Received BA from UCSC in Esthetics Studies and Movement Therapy 1975. Received MS from CSUH Dance/ Movement Therapy 1995 Graduate Programs in Movement Therapy 1981, Art Therapy 1995. Held Solo Art Show in Israel 1990 at Mishmar Haemek Art Gallery. Solo Art Show 2012 at Emeritis College Art Gallery, College of Marin, “Year of the Dragon”. Solo Art Show, 2017, Kol Shofar, Tiburon “Dancing Trees of Life”. Recipient of several awards: Best of Show at Marin County Fair 2008, 2009,2016 and several blue ribbons. Received 1st Place at El Cerrito Art Guild 2007. Nabeela Raza Sajjad has a degree in Mechanical Engineering from Pakistan. Although having not been instructed in the fine arts, she developed her own style of painting the traditional Arabic Calligraphy. She has been painting since 2006 and has exhibited in Bay Area Islamic Centers, Synagogues, Libraries and Museums. Nabeela is the founder of Islamic Art Exhibit, a non-profit organization (2009). She has been exhibiting artwork by local Muslim Artists in various Bay Area venues to promote understanding of Islamic Art to the greater American audience.